Our gym is the perfect spot for both community events and private functions. Rent some or all of our gymnasium, kitchen, stage, green room, tables, and chairs. Community Center Members save even more on gym rentals! 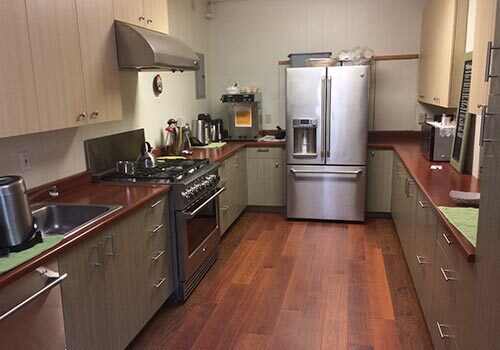 Kitchen is equipped with gas range, microwave, coffee maker, refrigerator, dishwasher, two prep sinks, and a large assortment of plates, cups, pots, pans, and utensils. 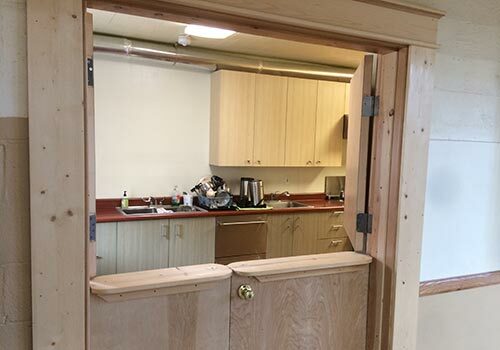 Kitchen has a dutch door opening to the gym. How many square feet is the gym? What is the gym’s seating capacity? How many tables can be set up? How many cars does the parking lot hold? Before 3:30 when Senior Center is open – 38. After 3:30 or days when Senior Center is closed – 47. There are 3 designated handicapped parking spots. Overflow parking on Johnson Street. 2 speakers, 2 monitors, 2 voice microphones and stands, 2 instrument microphones and stands, mixer, party lighting, projector and large screen. To rent any of our facilities, please call (509) 997-2926 for more information.